College Advising Corps traces its roots to 2005 at the University of Virginia. With the help of the Jack Kent Cooke Foundation, Dr. Nicole Hurd, then serving as Dean and Director of the Center for Undergraduate Excellence at the University of Virginia, launched the “College Guide” program by placing 14 recent UVA graduates in rural communities where college-going rates were below the state average. The advisers were charged with helping low-income, first-generation college, and underrepresented students plan for and complete the college and financial aid application process. The pilot project was a success, as many Virginia colleges reported increases in applications from high schools served by the advisers. Pleased with the results of the pilot year, in 2007, the Jack Kent Cooke Foundation, with additional support from the Lumina Foundation for Education, invested $12 million over four years to expand the program nationally. In March 2007, the program was renamed the National College Advising Corps, added 10 new higher education partners and moved its headquarters to the University of North Carolina at Chapel Hill. 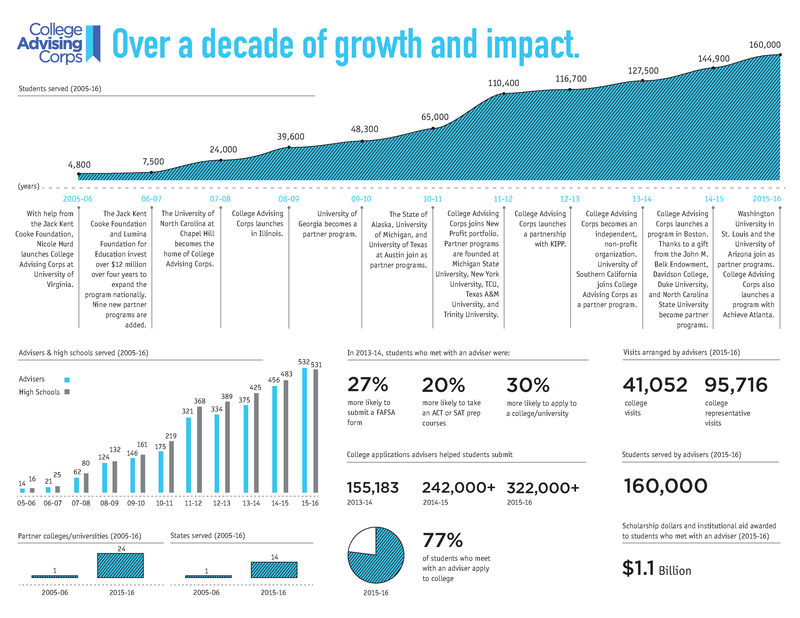 With the steadfast commitment of UNC’s senior leadership to build a sustainable national movement committed to college access and success, the National College Advising Corps grew year after year. In 2013, the National College Advising Corps became an independent, non-profit organization and was rebranded as College Advising Corps. From 2005 to 2016, College Advising Corps has served over 848,000 students in high schools across America. Today, after more than a decade of growth and impact, with more than 700 advisers, we serve students in 15 states, virtually and in person, in high schools both rural and urban, from New York City to the Rio Grande Valley to the San Francisco Bay Area.